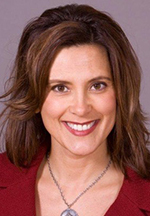 Gretchen Whitmer, the former minority leader in the Michigan Senate, has rejoined Lansing-based Dickinson Wright PLLC, the firm where she began her legal career. Whitmer, of East Lansing, was first elected to the Michigan House of Representatives in 2000 and to the Michigan Senate in 2006. In 2011, she became the first woman to lead a caucus in the Michigan Senate when her colleagues elected her minority leader. She left office in December 2014, due to term limits. Whitmer was previously a litigator at Dickinson Wright prior to her election to the state legislature. She received her Bachelor of Arts in communications and her juris doctor from Michigan State University.